We are not financial advisors and we would always recommend that you consult with one. We can only give advice on what the best deals are from Chard to match your budget and investment portfolio at the time you make enquiries. We try to keep our investment advice very simple. We cannot predict with any certainty what gold or any other commodity or currency will do over short, medium or long periods of time. Because of this, we tend to avoid giving any definite advice or strong opinion. There are some areas where we have considerable experience and feel we can safely give our thoughts. Some of it may appear obvious, but it is surprising how often we find ourselves repeating it. This is one of the most obvious pieces of advice we give. But we usually add "within reason". 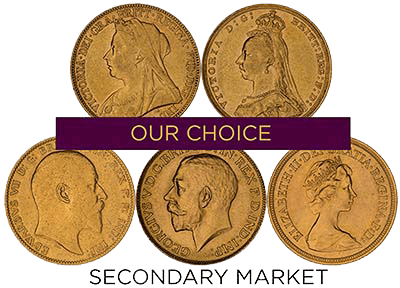 Sovereigns are a smaller, more attractive, more historic, and probably better known coin than krugerrands, therefore we believe it is worth paying a slight extra premium over and above krugerrands, to buy sovereigns. If you can buy sovereigns for about 2% differential above krugerrands, we believe this makes them a better long term buy. Currently for investors buying at least 50 sovereigns, the differential above krugerrands is under 2%, sometimes as low as 1%, and this makes them our first choice. Naturally this is slightly subjective, and reflects our personal opinion. Consider though that if you were to buy sovereigns at our 100 piece rate, you could resell them privately in singles at 10% profit, and be very competitively priced. You could not make the same claim for krugerrands. Sovereigns also have the advantage of being exempt from C.G.T. (Capital Gains Tax) in the UK. Krugerrands are the best known of all the modern one ounce gold bullion coin. They are available in greater quantities, and they can generally be bought at lower prices than any other one ounce bullion coins. This fact alone makes them one of the cheapest 1 ounce bullion coins to consider purchasing. True they are not particularly attractive, and don't possess much in the way of historical interest, but their production quality is consistently high, and they are a very cost effective way for small investors to buy gold. They are also easy to compare prices of, as they contain exactly one ounce of fine gold. Although at a quick look, gold bars may seem the cheapest way to invest on physical gold, there are some points worth noting, and some drawbacks. Our price for a single one ounce bar is usually exactly the same as for a single one ounce Krugerrand. Buy two Krugers though, and our quantity price breaks make krugerrands cheaper, and therefore a better buy. Also while it is true that larger bars, such as one kilo sell for a lower percentage premium than krugerrands, they are not as easy to resell. Only a specialist gold dealer is likely to give you a good purchase price for gold bars, and then often with less enthusiasm than for krugerrands, sovereigns, or other highly marketable coins. This restricts your choice of buyer, and most dealers would expect to pay slightly less for gold bars than for coins, expressed as a percentage of their intrinsic gold value. If you buy large bars such as one kilo, it is not very convenient if you decide to sell a portion of it! For very large investors, it may be worth considering London Good Delivery Bars, but the first thing to note about these is that, although they are usually quoted as being 400 ounce, or 12.5 kilo, bars, there is a large tolerance in their permissible weight range, from 350 to 430 ounces. There is also most tolerance allowed in their purity, the minimum being .995 or 99.5% pure. Most "small" bars are .9999 purity or 99.99%. Because of these factors, 400 ounce bars are usually only traded between governments, central banks, and major bullion banks, and other professionals. Coins and bars are usually the lowest price. You can view all of our best priced products in our best value section. Please note you will be given our choice of date and mint (if applicable). You can achieve even lower premiums by buying larger gold bars in larger quantities. We stock gold coins from mints from all over the world including the Krugerrand, the Maple, the American Eagle, the Australian Kangaroo, the Chinese Panda and of course, the Britannia. Current years are often available at lower premiums compared to backdated years. This is because they are still being minted. Once a coin stops being minted they can be more difficult to source. This is not to say that you cannot get backdated coins at good bullion prices. If you sign up to our mailing list, we send out secret offers for dated coins when we have surplus stock. You might think due to the above advice that we would advise gold bars, one ounce gold coins or bars and gold sovereigns as the best gold investments, in that order. We believe, however, that sovereigns are often worth paying a slight extra premium for, because of their smaller size, and the historic and aesthetic value which you get for next to nothing. Of course our tailored advice can differ with changes in the market and depending on the amount you are looking to invest. One of the main things to consider is whether or not you will need access to your investment. If you are investing hundreds and thousands of pounds and have plenty in bank accounts, then the chances of you needing to sell some of your gold for an emergency is slim, however, if you are investing a few thousand pounds and only have limited funds available for emergencies, a repair to your car costing £500 may need you to dip into your investment. In this case, it is much better to sell two sovereigns than one 1oz coin or a bar and have surplus cash that you never wanted to access, leaving you with cash you may spend or have to re-invest. Most of our customers prefer to physically hold their gold investment. If you are concerned about the security risks of keeping your gold at home, we also offer a storage facility at a fee of only 0.05% per month (excl. VAT). The majority of gold bars and gold coins are classed as investment gold and can now be bought free of VAT in the UK and the EU since January 1st 2000. 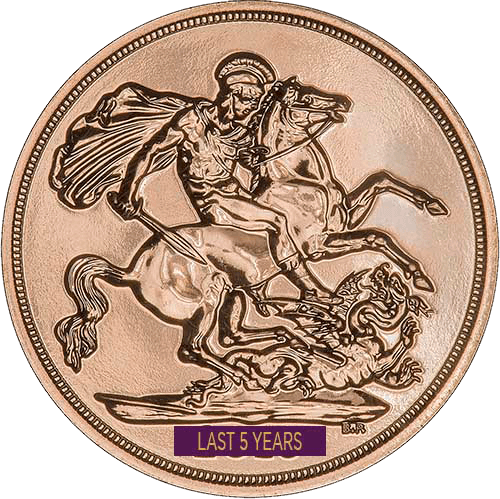 As gold sovereigns, half sovereigns, and gold Britannias, gold Lunar and gold Queen’s Beast coins, are sterling, they are treated as exempt from Capital Gains Tax (C.G.T.). I would like to buy gold now I hear you say - please find our best prices bullion options in our best value category. 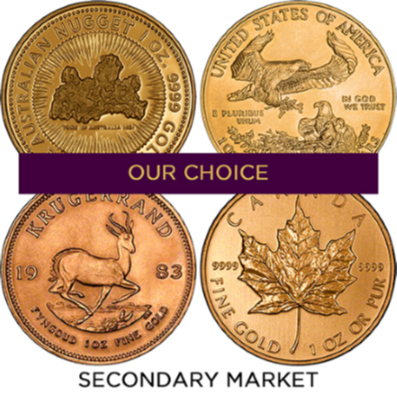 Our most popular products are the bullion sovereign, Krugerrand and one ounce secondary market gold coin. Older Coins or Modern Bullion Coins? Which One Ounce Bullion Coins? Which Size of Bullion Coins? Rare Gold Coins as an Investment - Rare gold coins or gold bullion coins. Which is the better investment? We try to give some impartial advice to collectors and investors. Don't pay inflated prices or high premiums for investment gold coins unless you know what you are doing.